I learned this tip long before I even realized that I had a cast iron skillet. I have been listening to chef Mike Colameco’s Food Talk radio show for years, and he has had dozens of calls about how to clean cast iron pans. 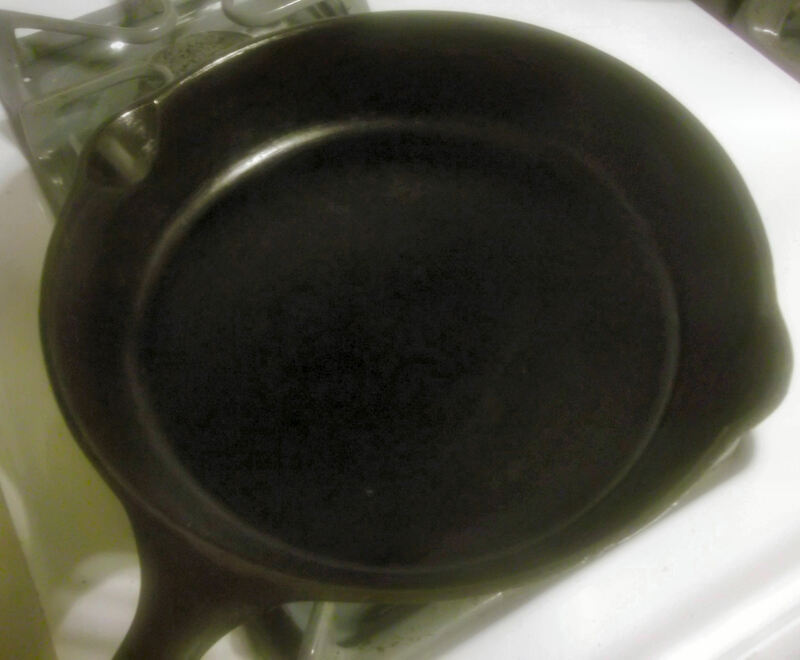 So I was thrilled when I was reorganizing the basement one day and found an old cast iron skillet stashed away. It was dirty and a little rusty, but I tried Mike’s technique to clean it and it worked like a charm! Start by cooking something really delicious in your cast iron pan, and then let the pan completely cool. Wipe out as much as you can with a dry paper towel. Now that you have a cleaner dirty pan, let the fun begin! Pour in some Kosher salt. 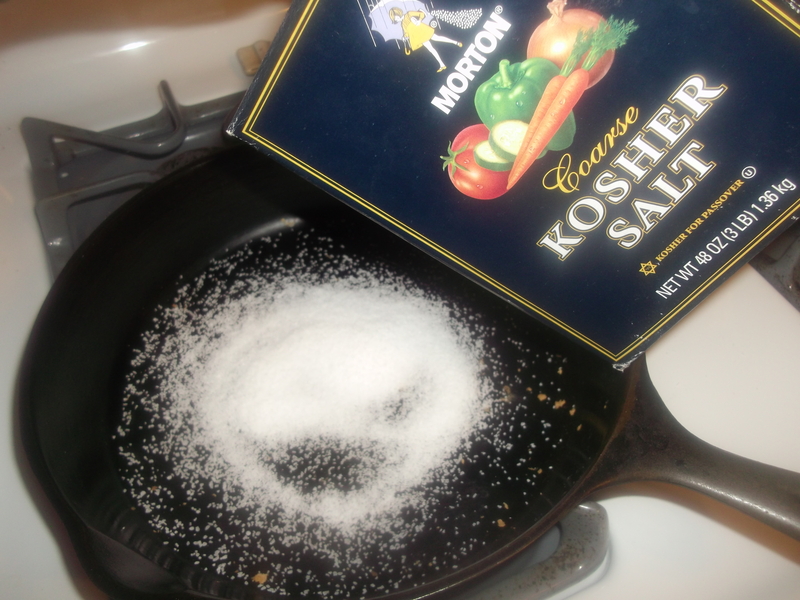 This is one “recipe” where you can’t really substitute regular salt for Kosher: its large, coarse texture is crucial. Now pour in enough oil to make a gritty paste. It doesn’t really matter what kind of oil, but now is probably not the time to break out the high-priced extra virgin olive oil. Use something inexpensive: I used canola. And a really, really bright camera flash, apparently. Sorry about that. Mix the salt and oil to make a paste. Use your fingers if you want, or use a clean dishrag. 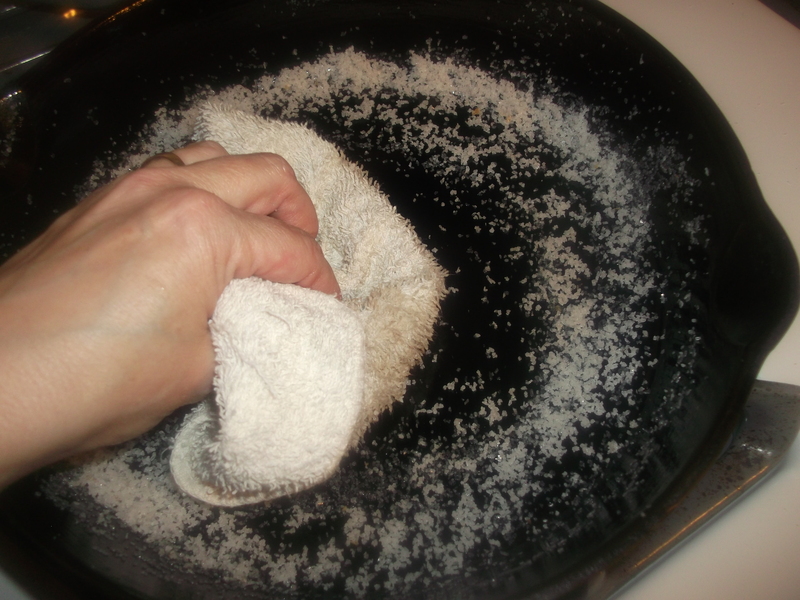 Take a clean DRY dishrag (remember, keep water and all things wet away from cast iron!) and rub the paste all around the pan. 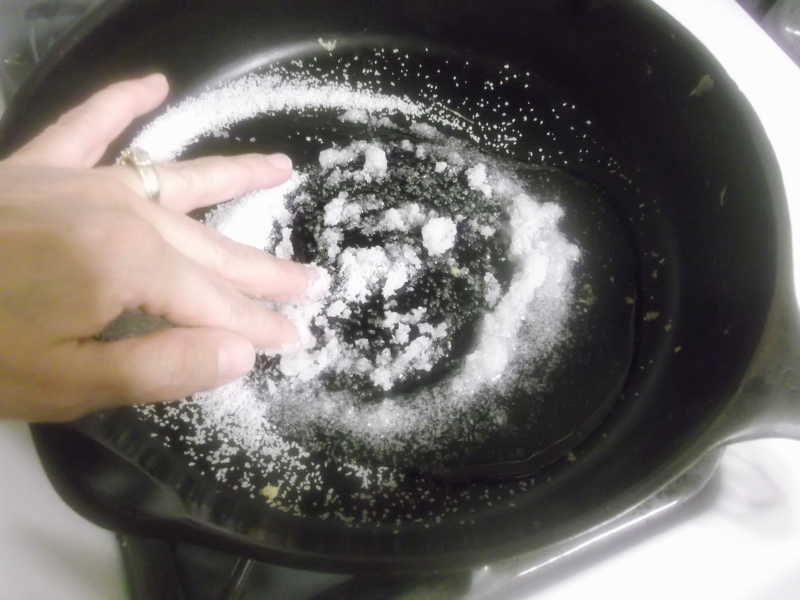 The grit from the salt will scrape up any dried food, or even any rust spots if you exposed your pan to water prior to reading this tip. Keep going round and round the pan, exfoliating the food and bits away. When you think you have scrubbed off everything that was stuck, dump all the salt out and shake out the rag. 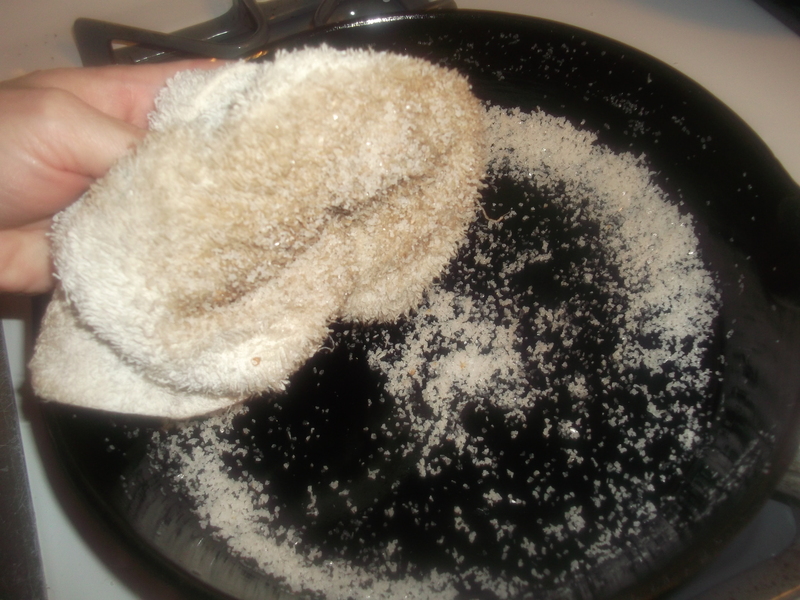 Wipe the pan clean, either with the same rag or another paper towel. Now you have a mostly clean pan. 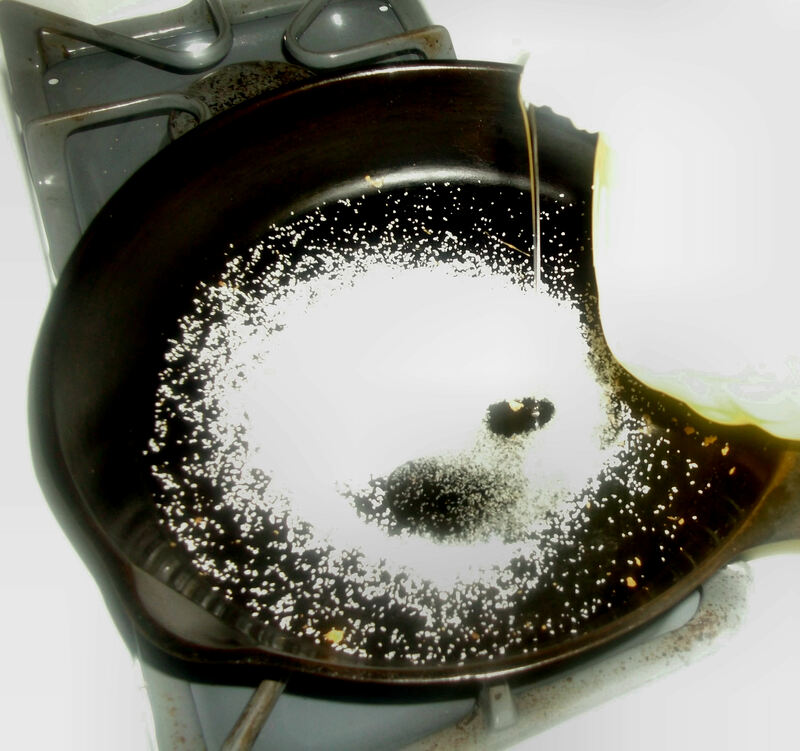 Wipe out any residual oil until you have a nice sheen to the pan. 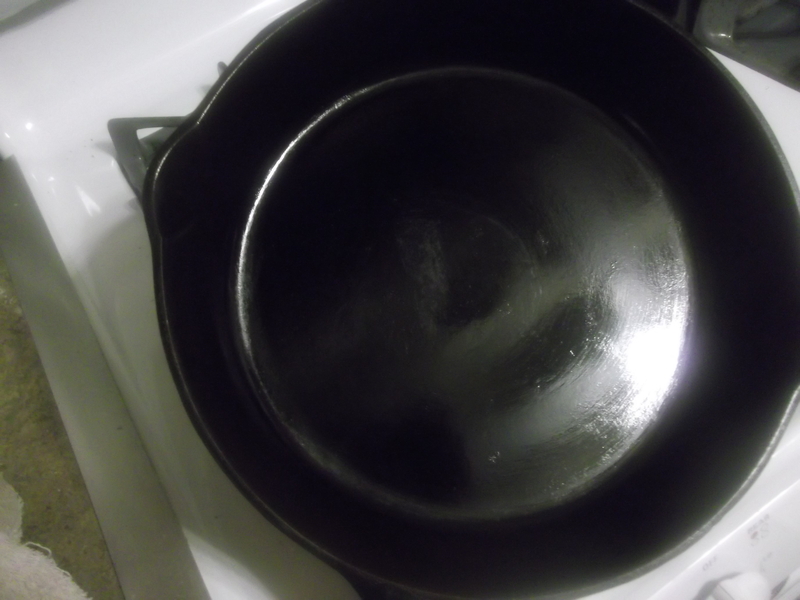 Use this technique to clean your cast iron pans, and they will last forever, keep their nice sheen, and stay rust free. Enjoy! Cool. I didn’t know how to care for our cast iron skillet. Thanks, Diane! I’ll share this with my hubbie as well. Great info. Thank you so much. 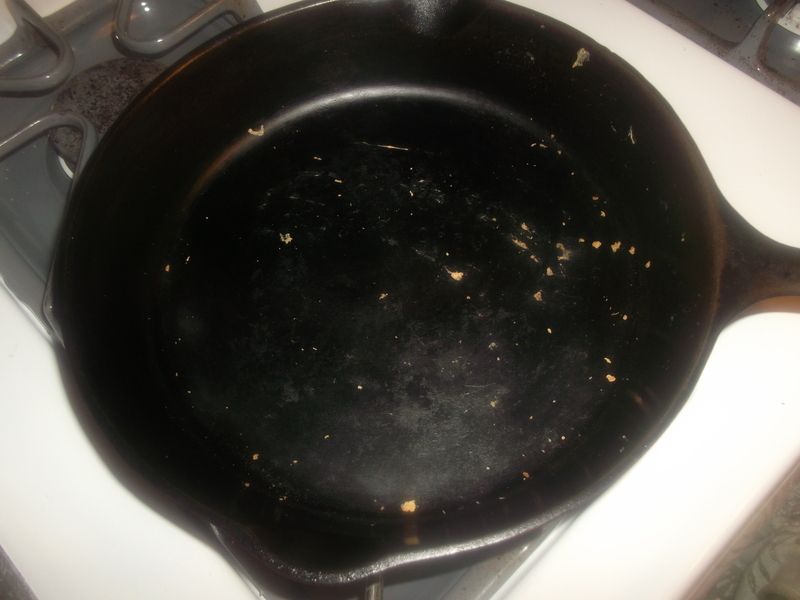 Can wait to clean my skillet.